AllYouNeed Hotel Salzburg v Salzburk, Austria: Zarezervujte nyní! Culture and Chocolate. The sound of music and the taste of marzipan. A divine city surrounded by a fabulous landscape. This is Salzburg, famous and popular by visitors all over the world. 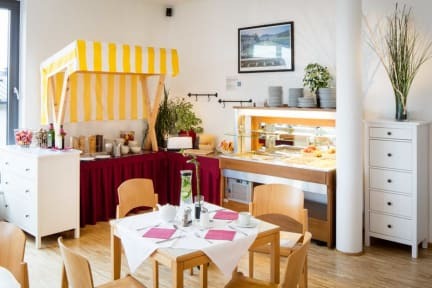 And the AllYouNeed Hotel Salzburg, located at the foot of the Kapuzinerberg in quiet location, but near the vivid centre of the old town of Salzburg, is the perfect place to be. The hotel offers 69 non-smoking rooms with ensuite bathroom, hair dryer, flat screen TV with international channels, direct dial telephone and free Wi-Fi and LAN connection. 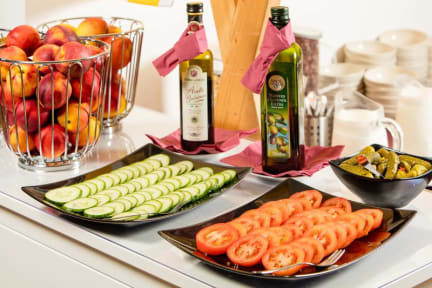 A delightful breakfast buffet with cold and hot dishes is included in the price and is served daily and on sunny days can even be enjoyed on our terrace, which overlooks the rooftops of the city. What more do you need for an energetic start in a day? From the hotel you can easily reach all sights of Salzburg, like Mirabell palace, Getreidegasse, Festspielhaus, Salzburger Dom or Mozartplatz on foot. The vivid Linzer Gasse with its boutiques and restaurants is a stone’s throw from the hotel. If you are more the sporty type of person, you can ascend the heights of the Hohensalzburg fortress on the mountain Mönchsberg and enjoy its panoramic view over the city or hike through the beech forests on the mountain Kapuzinerberg. Culture meets nature – all in the heart of one of Europe’s most amazing cities! Our seasonal-hotel is open every year from 1 July until 30 September. Cancellation policy: 24 hours before arrival free of charge. Payment upon arrival by cash, credit cards (Amex, Mastercard, Diners Club, Visa), debit cards (Maestro). This property may pre-authorise your card before arrival. Reception is staffed from 07:00am to 23:00pm, but available for emergencies around the clock. Our season-hotel is open every year from 1 July until 30 September.